Three versions of the Harrington Seed Destructor (HSD) underwent extensive tests in Western Australia during harvest 2010-11 to improve the machine’s performance in crushing weed seeds. Associate Professor Michael Walsh, from the University of WA, says modifications made to the machine improved its performance when tested in barley at Wagin. Modifications included the removal of an auger, which was originally fitted to the transfer duct but was found to cause blockages when conveying chaff to the mill. Dr Chris Saunders – a research engineer with the University of South Australia (UniSA) who is involved to help improve the design and operation of the HSD – says the chaff is now moved pneumatically from the rear of the harvester through a duct to the mill. Pneumatically conveying bulk material relies on several parameters, one of which is velocity of material in the duct. The size of the transfer duct has been reduced to make the material flow faster towards the mill, which Dr Saunders says should reduce the chance of blockages. Monitoring equipment has been fitted to the cabin of the harvester on the latest version of the HSD (blue) to allow the driver to check for potential blockages. For his PhD, UniSA student Nick Berry is investigating options for improving the efficiency of the HSD, particularly its energy use. He is measuring how much energy is required to damage weed seeds sufficient to make them non-viable when returned back to the paddock. “We’re also looking at how chaff and straw are separated in the rear of the harvester and whether we are catching all the ryegrass that enters the front of the harvester,” he says. UniSA engineers and personnel from CGS Engineering (the company with the contract to develop the HSD) have added an adjustable plate to the harvester to improve the sample and collect more weed seeds when harvesting. Tests have shown that if 20,000 ryegrass seeds are introduced into the front of the harvester, only 20 exit the HSD as viable seeds. “It’s a good result,” Nick says. The third HSD prototype (blue) has a modular design, which makes it significantly easier to build. “We wanted to eliminate some of the hydraulics and simplify the machine to reduce its cost to produce and run,” Dr Saunders says. The latest model is lighter than the previous prototype (green) and comprises a ladder-type chassis design with two rails that are cross-braced to support the engine and mill. Dr Saunders and the UniSA team installed an extensive monitoring and data-logging system onto the second HSD prototype during 2010, which allowed them to monitor all-important operational parameters. He does not believe the engine or the mill will limit the machine’s performance, but suspects the biggest influencing factor – especially when moving to higher capacity headers – will be the amount of chaff leaving the harvester and how it is delivered to mill. In crops yielding 4 to 5t/ha, the chopper system (run from the HSD) draws about 22 to 37kW (30 and 50hp). The slinger fans that convey the chaff to the mill used 10 to 12kW (13 to 16hp). 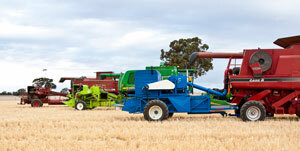 On the latest prototype, the single slinger fans at the rear of the header are driven by the harvester. The mill runs at 1400rpm and the Isuzu engine uses about 16 litres of diesel per hour (about 3.5 to 4.0L/ha). Ray Harrington notes that this is equivalent to the cost of one herbicide application. The mill is estimated to last 100,000 hours. Dr Saunders is confident the HSD can be scaled up for class 8 or class 9 harvesters, without having to add a larger mill. He says although most of the tests so far have been with wheat or barley, chaff from alternative crops (such as lupins and canola) needs to be tested. During harvest 2010, the second HSD prototype (green) was tested at 12 locations across the WA grainbelt to compare its performance against chaff carts and narrow windrow burning in terms of weed seed destruction. The results will be evaluated this year after weed germination counts are carried out at each trial site. Michael Walsh hopes to trial the HSD in Queensland, NSW, Victoria and SA during harvest 2011 to give growers outside WA an opportunity to see the device working in the paddock. The HSD is available for purchase on a semi-commercial basis. A commercial supplier is being sought with the hope of the HSD being commercially available in 2012. Read this article in GC West; North issue 92 - Subscribe and recieve the hard copy of GroundCover in your mailbox for free, remember to select 'Post' as your subscription method.